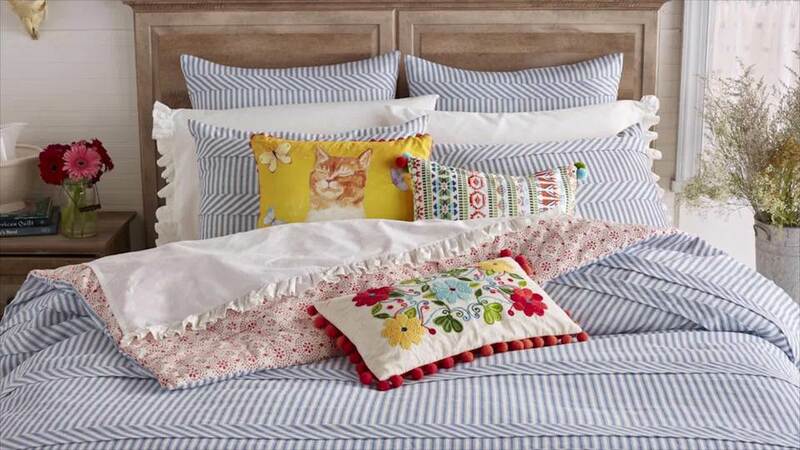 With bedding, there's often a gap between style and comfort, but with this sweet striped duvet made of a textured cotton, you get the best of both worlds! Get nice and snug with reversible Ticking Stripe, whose perfect pleats and subtle tones combine trendy with cozy. Available in full/queen and king sizes. I'm glad I had a chance to choose this The Pioneer Woman Ticking Stripe Duvet Cover, Blue. It was as pretty as I thought it would be. Looks kind of countryish too. I'm very happy with it. I like that it's reversible, for a different look on my bed. 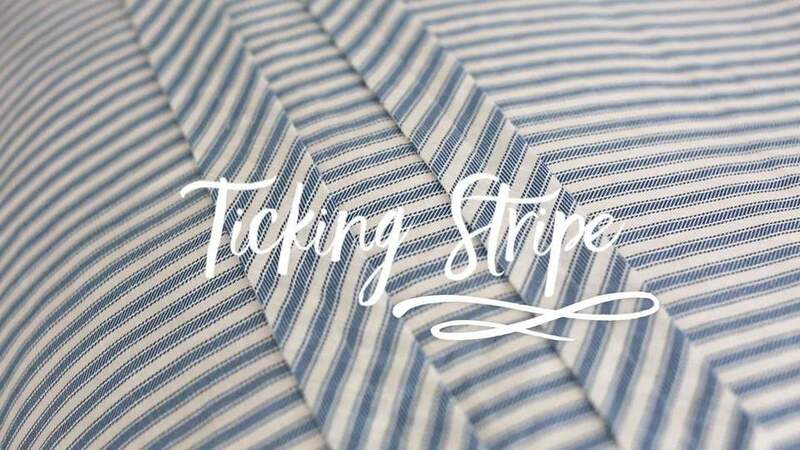 This very nice Duvet has ticking stripe design. It comes in Full/Queen Size. This one is blue stripe. The cover is 90" X 94". The team is made in Pakistan. It is sturdy and looks great on the bed. I ordered this the day Ree Drummond's collection launched online--the duvet cover arrived the following Monday--so not as fast as I was expecting but fast enough for bedding. I was very happy to see the duvet when it arrived--it is a sturdy cotton fabric and seems very well made. I will be washing it before I put my down comforter in it, since it's cotton, I think it will soften right up. The duvet has clear buttons and internal ties to connect to your down comforter. I saw another review on this page that referenced this being a comforter---THIS IS NOT A COMFORTER. This is a duvet cover that you pair with your existing down comforter shell. The only issue I saw on this was a few loose and long strings where the clear buttons are--I just trimmed them down in a few seconds. Overall, I think this is a very nice duvet that will look great on my bed! I was thrilled to have the Pioneer Woman Ticking Stripe Duvet Cover. The Chambray Blue and Cream, are perfect compliments to my bedroom decor. Very well made, durable. This pairs well with my cream bed skirt. I am looking into getting the matching pillow shams to compliment the duvet cover, for a complete look. Perhaps I don't know what a duvet is. This bedspread has a very nice blue striped side with crossing lines of material designed to make it more attractive. The other side is less attractive and does not match if you turn down your bedspread instead of tucking in the pillows. Perhaps it is meant to be reversible but, if so, it is a strange color combination. The bedspread hugs your mattress and is easy to make up in the morning. You also can nap on top of it without messing it up very much. I bought the queen size to accommodate my deep full mattress and that worked very well. The material is very comfortable and it appears to be long lasting. The color goes with most anything. Overall, this is an attractive purchase from a company that designs a good product. I really like this duvet cover. The color is a light denim blue in color and is a perfect weight for the cool nights of fall and spring. It fits my bed well and keeps its shape. I have had a few duvets in the past that would sort of move around on the bed if you barely touched them. This duvet washes well and if you take it out of the dryer when its still warm it doesn't wrinkle and can go right back on the bed. It does a great job of keeping dust of my bedding. I really do like the blue pattern, I took away one star because of the orange/red flowery pattern of the other side. In my opinion I would have liked it to also have been in the same shade of blue. I use duvet covers most of the time, and was excited about this one. It is a great disappointment. I washed it before using it, and discovered that it is going to require difficult ironing in order to look pleasing on the bed. The fabric is a heavy, coarse weave and feels like denim. It will have to be ironed, either while damp or heavily sprayed with spray starch in order to make the decorative tucks lie flat and to remove the wrinkles. On the positive side, it is a good fit for my queen sized down comforter, and it will fit my light-weight synthetic comforter for spring and fall. However, the wrinkled, messy appearance (without ironing) does not lend it the concept of "easy care." This duvet color is very pretty, however i would say it is a slightly duller blue in person. The ONLY reason i am no longer using this duvet is because of the sizing. I have a queen duvet, i purchased the full/queen cover and it is HUGE. There is at least a foot of extra fabric hanging off the bed and sleeping with all the loose fabric is so uncomfortable. Would prefer it mich more if it were a little more form fitting. A king would probably fit in a size queen.